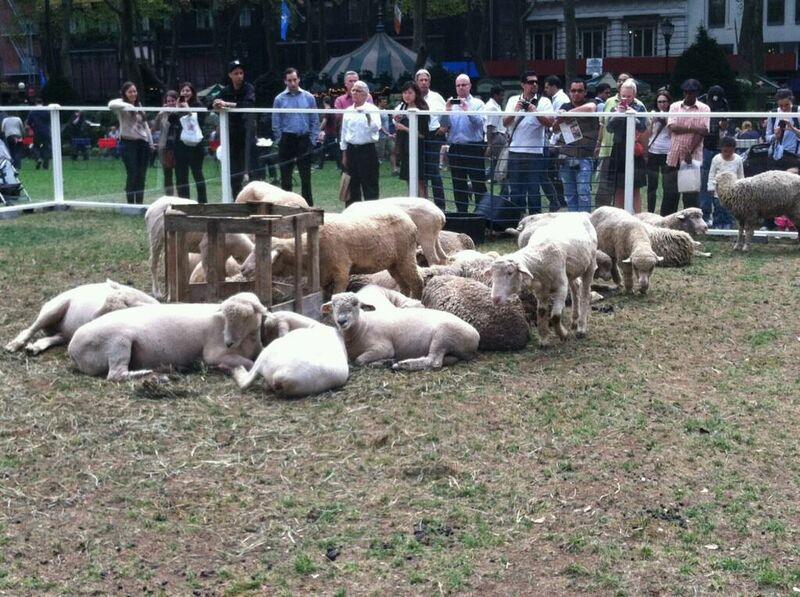 A few weeks ago, Prince Charles brought his “Campaign for Wool” to the US, particularly to Bryant Park September 27th to promote the wool industry calling it “Wool Uncovered”. 30 sheep were brought in from an upstate farm and were free to roam in a 40-foot-by-40-foot plexiglass-enclosed area in the middle of the park. There was wool in the raw and wool as the final product putting slip covers on the park’s folding chairs and bringing in chairs, beds and rugs made out of wool all for us to touch, feel and experience. The timing of the campaign was perfect. If the idea was broached any other time of the year, Bryant Park may not have been the location for this campaign. However, because the park was preparing to rip up the grass to put in the annual Citi Pond ice rink, Prince Charles’ campaign was given permission to the bring in the sheep and onto the grass. The park also drained the fountain and filled with it wool sculptures which normally wouldn’t have happened if we weren’t approaching the winter season and preparing for the holiday shops to be open by October 26th. This entry was posted in Firsts and tagged Bryant Park, campaign for wool, Citi Pond, holiday shops, Prince Charles, Wool Uncovered. Bookmark the permalink.